Elizabeth Henstridge teases the future of Simmons’ relationship with Fitz on Agents of SHIELD. Captain America: Civil War merchandise reveals details about Cap’s new costume. Plus, a tense clip from Doctor Who, a sinister image from Jessica Jones, and news about Game of Thrones’ huge battle. Spoilers Now! I’m super excited, of course, Gal Gadot is super talented, Patty Jenkins will perform, and we will shoot in film… What excites me most is to work in a movie with a superhero woman. With a woman in the lead role. I am teamed with this intelligent, beautiful and strong woman to defeat the villains and save humanity. Joblo has released an extensive flurry of rumors about the film. They largely allude to previously circulated rumors—that the movie will be set partially in World War One and the Modern day, and that the villains are Circe and Ares—but adds a few new rumors. Firstly, Wonder Woman’s classic Invisible Jet will appear in the movie at several points (including the first time Diana leaves Themyscira), but most interestingly, Batman will have a major cameo appearance in the movie. 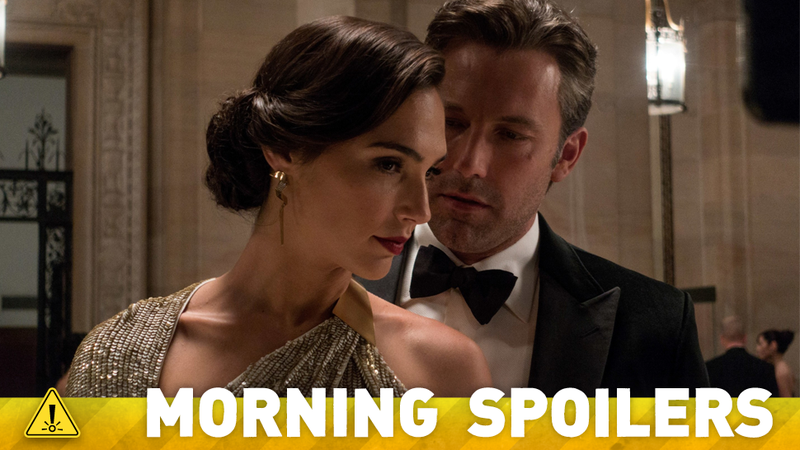 Batman will allegedly watch Wonder Woman save the day in the third act of the movie from the shadows, shown watching her save civilians and fight. After the climax of the movie, Batman approaches Wonder Woman to introduce himself and acknowledge her as a fellow hero, establishing their relationship going into Batman v Superman. As ever with rumors like this, treat them with skepticism until we hear something more official. Our hope is that they are all interconnected and of course standalone, right? I think architecturally, the best — I think I believe this — the best serialized storytelling has integrity from start to finish of the episode, whether it be TV or a movie or comic book or novel series or short story series. You want to be able to satisfy both appetites — which I think is very different from procedural or episodic. You want to feed the instinct for the short-term gratification and the longterm gratification. So we’re trying to do both. I don’t really know that much about it, but I think it’s going to be a buddy picture with Thor and Bruce Banner. I think they’ll probably fight... There’s no doubt, everyone wants us to fight at one point. We’re getting very close, the next thing’s really gonna be the movie. There will be commercials, but no more trailers. We’ve all been working really hard to give people something that will be special to them. Our fingers are just very tightly crossed that when people see the movie they’ll like it. Allegedly official merchandise for the film has, bizarrely, been spotted in the wild—and a new T-Shirt reveals a new picture of Captain America, showing off his new suit that integrates an homage to the classic chainmail look of his comic book suit. The end is near in a new TV spot for the movie. Watchers on the Wall has a further set report from Saintfield, Northern Ireland—the site of a major battle featuring the houses of the North, House Bolton, and the very-not-dead Jon Snow. The report claims that Sansa Stark actress Sophie Turner has been seen filming some sequences related to the battle—the battle will allegedly see some major casualties, including some characters we’ve gotten to know—including two characters being flayed and burned alive by Ramsay Bolton on massive crosses. The battle will also feature an appearance by the Wildling giant Wun-Wun. Oh, for sure! I think she’s always known how much he cares about her. Seeing how selfless he is in saying yes... the aim is to get Will back, and — if they do get Will back — that makes things very difficult and painful for Fitz. The best thing for him would be to say, “Oh, no, it’s just impossible, there’s no way.” But he doesn’t do that. He has such an unconditional love for Simmons and he just is a good dude and will always do what’s right morally. I think, in that moment, she just can’t believe he is so no-nonsense about it. He’s already made his mind up and he’s getting on with it. There’s no kind of melodrama. His love for her is just so strong he doesn’t even question it... When I read that, I was just in lots of tears. Osgood is terrorised by a Zygon in a new clip from “The Zygon Invasion”.